Controlling garden weeds is a simple process. You can almost eliminate the weeds from your vegetable garden by applying a few basic principles. What is a garden weed? What do you do if you have tons of weeds? Weeds are plants that are growing where gardeners don’t want them to grow. Weeds rob desirable plants of water, nutrients, and sunlight. Weeds may harbor insects and diseases. Weeds detract from the beauty of your garden. Annuals - those growing from seeds and that only live one year. Biennials - produce a cluster of leaves the first year of growth and in the second year they flower, set seed, and die. Perennials - live for many years and reproduce by seeds, rhizomes, stolens, tubers, bulbs, etc. and are more difficult to control and get rid of. Remember, weeds follow the Law of the Harvest - whatever you plant or leave to grow will multiply. The time it takes to keep your garden weed-free will dramatically decrease, if you never let the garden weeds go to seed. Then you can spend less time in the garden weeding and more time preparing your soil, planting your seeds, and harvesting your food. This equals more FUN! This spring we had a lot of rain but even with the moist, fertile soil we didn’t get many weeds. This is because I didn’t let the weeds go to seed during the previous summer or fall. Most people do a good job weeding in spring, but as your garden starts to grow, those little weeds grow unnoticed. They go to seed and drop their seeds into the soil for the next year's garden. Law of the Harvest at work. BINDWEED OR MORNING GLORY is a perennial that is in most areas of the world. The roots go very deep (about 30-50 feet). You can hoe forever, and it keeps coming back. The best way to get rid of it is to spray it with “Ortho Weed-B-Gone”. This spray is only effective on broad leaf plants and will not kill grasses. It is a hormone that stimulates the plant to grow itself to death. This effectively kills the roots. You will find that a small garden sprayer is useful in spraying the plants you want to eradicate (get rid of). Do this throughout the growing season by spraying the individual plants when they are actively growing. This hormone affects the roots more adversely in the fall than during the summer, because just before the first frost the plant is carrying its nutrients to the roots. My garden was full of bindweed but is now essentially bindweed free. Using black plastic will also help inhibit its growth if there is an over abundance of this weed. DANDELION is a perennial weed that mainly affects lawns. However, the light fluffy seeds are often found in vegetable gardens. They are not a major problem if they are removed when they are young. Rotor tilling in the fall and spring of the year normally remove the central perennial taproot. CRABGRASS- is a weak late summer annual. It grows in lawns and gardens. It spreads mainly by seeds. Hoe it or pull it up before the seeds develop. You can sprinkle corn gluten meal on the soil as a pre-emergence (keeps the seeds from germinating in the soil). This is an organic herbicide for crabgrass. QUACK GRASS- is a perennial and spreads by its seeds or by its rhizome root system. You either have to till it until all the white rhizomes are dead or dig up the rhizomes and remove them from the garden. One little rhizome will grow in moist soil and become a new series of plants. RED ROOT OR PIG WEED is an annual. It is spread by an abundance of seeds as shown in the picture. It is easily identified by its red stem and taproot. You won’t have any problem with this weed if you will hoe it out while it is young and immature. If it goes to seed, pull it up and remove it from the garden. 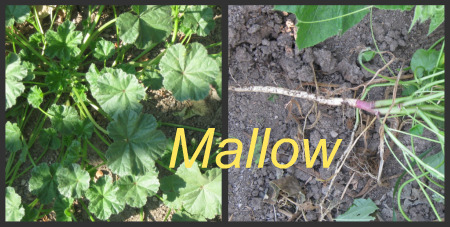 MALLOW OR MARSHMALLOW is either an annual or biennial depending on the climate. It has a deep tap root. If you pull this out while it is a young plant, it will not spread. 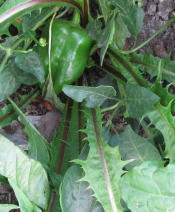 It grows unnoticed with your garden vegetables. It blends right in and sometimes you have to be looking for it to find it. PURSLANE OR RUBBER WEED is an annual weed. It is difficult to get rid of once it gets started. Do NOT hoe or rotor-till this weed. The more you chop it up the more seeds you plant. Every piece of its leaves, stem pieces, or seeds will become a future plant. You will find that physically removing the plant before it goes to seed is the easiest way to control it. Make sure you get the whole root. One plant that has gone to seed will produce enough seeds to last you several years. 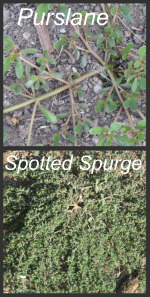 If your purslane is out of control, you can use Treflan® TR-10 herbicide. This will not kill the garden weeds that are already growing; it will only keep new seeds from germinating. Your soil will be sterile for about three+ months. Seeds won’t germinate in your soil. This includes your garden seeds. If your garden is up and growing, it shouldn’t hurt the plants, but remember to use herbicides only when it’s impossible to fight the weeds by pulling them out. SPOTTED SPURGE is an annual similar to purslane. It is a prolific seed producer and often goes unnoticed. Deal with it similar to purslane. 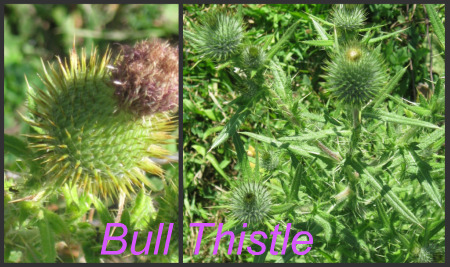 Bull Thistle is a biennial and is easy to control if you remove the plant the first year. The problem comes when the plant forms purple seed bulbs on top of the plant, the bulb opens up, and the wind spreads the seeds. Sow Thistle is a summer annual – yellow flower. Pull it up before it goes to seed. The seeds are spread by the wind when the seedpod on the top of the plant opens. 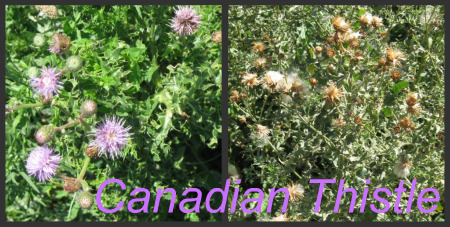 Canadian Thistle is a perennial and has a taproot. Pulling out this thistle will not keep it from coming back because it spreads by its seeds or its root system. It is easily affected and controlled by spraying with “Weed-B-Gone”. There are many other kinds of weeds, but the garden weeds on the list are the most troublesome. Just remember don’t let them go to seed particularly during the summer and fall. If your garden weeds go to seed, you will find that you’ll spend a lot of time weeding. Your goal is to spend less than 10 hours per year weeding a modest to large size garden. It really is possible! It may take more time when you first start working a piece of ground that has lain unattended for a year because the garden weeds have gone to seed or are spreading by their root system. Just be patient and follow the guidelines suggested and your weed population will diminish. If you have soil that is full of garden weed seeds, you may want to use black plastic between the rows to help control the weeds. If you are planting individual plants like tomatoes or peppers, lay the plastic down and cut holes in the plastic where you want to plant your plants. If you are planting a row of seeds or plants like carrots or onions, lay the edge of the plastic next to the row of vegetables that you are planting. The down side of using black plastic is that it cuts down the air supply to your plants. We’ll talk about some other weed control suggestions when we talk about Garden Watering Systems I don’t recommend using chemical sprays any more than necessary. 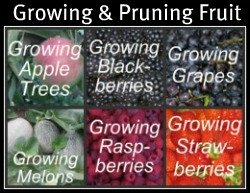 They can affect the quality of the produce coming from your garden. Don’t get discouraged the first year when the weed population is out of control. It will get better if you don’t let the existing seeds multiply. The LAW OF THE HARVEST works for your desired plants and for your garden weeds. 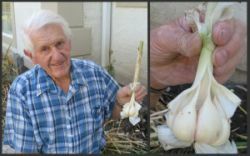 Applying these principles will help you to be a successful, happy gardener. Gardeners don’t grow old, they just spade away!